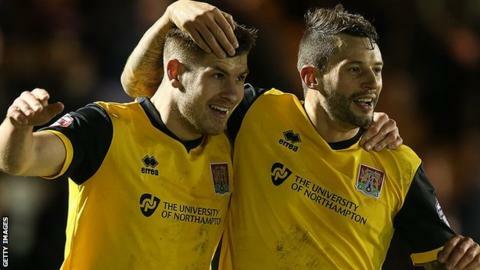 Northampton earned a narrow win at Plymouth to move level on points with the Pilgrims at the top of League Two. James Collins gave the Cobblers the lead after he dispossessed Plymouth keeper Luke McCormick from Kelvin Mellor's ill-advised back-pass. Marc Richards doubled the visitors' advantage after the break when he finished off a swift passing move. Gregg Wylde turned in Ryan Brunt's cross to give the hosts hope, but they could not find an equaliser late on. Match ends, Plymouth Argyle 1, Northampton Town 2. Second Half ends, Plymouth Argyle 1, Northampton Town 2. Attempt missed. Ryan Brunt (Plymouth Argyle) header from the centre of the box is close, but misses to the left. Kelvin Mellor (Plymouth Argyle) wins a free kick in the attacking half. Foul by James Collins (Northampton Town). Attempt missed. Gregg Wylde (Plymouth Argyle) header from the centre of the box is close, but misses to the left following a corner. Corner, Plymouth Argyle. Conceded by David Buchanan. Craig Tanner (Plymouth Argyle) wins a free kick in the defensive half. Foul by Ryan Cresswell (Northampton Town). Substitution, Northampton Town. Ryan Cresswell replaces Ricky Holmes. Ryan Brunt (Plymouth Argyle) is shown the yellow card. Gregg Wylde (Plymouth Argyle) wins a free kick on the left wing. Foul by Ricky Holmes (Northampton Town). Peter Hartley (Plymouth Argyle) is shown the yellow card for a bad foul. Jason Taylor (Northampton Town) wins a free kick on the left wing. Substitution, Northampton Town. Jason Taylor replaces Marc Richards. John-Joe O'Toole (Northampton Town) is shown the yellow card for a bad foul. Carl McHugh (Plymouth Argyle) wins a free kick in the defensive half. Foul by John-Joe O'Toole (Northampton Town). Attempt blocked. Ryan Brunt (Plymouth Argyle) left footed shot from the centre of the box is blocked. Kelvin Mellor (Plymouth Argyle) wins a free kick on the right wing. Foul by Nicky Adams (Northampton Town). Attempt missed. Nicky Adams (Northampton Town) right footed shot from outside the box is too high. Goal! Plymouth Argyle 1, Northampton Town 2. Gregg Wylde (Plymouth Argyle) left footed shot from the centre of the box to the centre of the goal. Assisted by Ryan Brunt. Corner, Plymouth Argyle. Conceded by Nicky Adams. Attempt missed. Nicky Adams (Northampton Town) left footed shot from outside the box is close, but misses the top left corner. Corner, Northampton Town. Conceded by Luke McCormick. Corner, Northampton Town. Conceded by Kelvin Mellor. Corner, Northampton Town. Conceded by Carl McHugh. Foul by David Buchanan (Northampton Town). Foul by Ryan Brunt (Plymouth Argyle). Brendon Moloney (Northampton Town) wins a free kick in the attacking half. Corner, Plymouth Argyle. Conceded by Brendon Moloney. Kelvin Mellor (Plymouth Argyle) wins a free kick on the left wing.